I found a card very similar to this on SCS this morning. I wanted to do one more card for the workshop today. SU does not have chocolate brads, and they retired the copper ones, so what's a girl to do? Well, make them silly. I took my retired copper brads and inked them up with chocolate chip craft ink. Dipped the brad in clear embossing powder, and heated. So what do you think, easy huh? Oh one thing make sure that you use the tweezers to hold the brad -- they get REALLY hot!!! Hope your class goes well! Thanks for sharing! This is gorgeous, Corie! I love brown tones and love, love, love this set! Beautiful dp, too! My SU Demo showed us to use our dye inks to colour the brads, then dip in your VersaMark pad, coat with clear embossing powder and heat set. Just another route, if you don't have a lot of craft inks. This is a gorgeous card, Corie. The browns are yummy. Great way to use the set, too! This is a beautiful card Corie, I learned something today also. I learned that you can make custom color brads...thank you for sharing. Beautiful card. Love that chocolate chip! Stunning! Very elegant looking. I really love it! This is so pretty, Corie. I must get that stamp set. Every time I see one of your beautiful cards, I want that set. Thanks for the tip on the brads. Must try,. This is gorgeous! I love the colors, and you did a fab job with the brads!! Very pretty card! Also I just wanted to thank you for co ordinating the swap the cards were so pretty! I posted them today! That is one B.E.A.U.T.I.F.U.L card!! I LOVE this card! It is gorgeous. OMG, this card is awesome!!! I absolutely love the colors, well actually EVERYTHING! Great job! Beautiful! 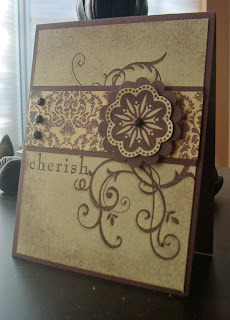 I really need to use the baroque background paper with the baroque motifs stamp set. They go so well together. I got my holiday swap in the mail yesterday. They were awesome. Your swap card was even more gorgeous in person Cori! You went above and beyond! I totally love this... love seeing this set used by you... you just bring it to life!!! I love this card. It's gorgeous! I'm keeping my fingers crossed we get this set in our next mini. Wow, this card is stunning! Yeah, what is up with the brads? I hope they hook us up on the next catty! I look at your cards - they're so beautiful! Great work. Love this yummy chocolate card! It's beautiful! This card is Totally Beautiful!! Love the colors and design. Such an awesome card. I just ordered this stamp set myself and should get it this week (I hope). The way you put the patterned paper in the centre is lovely. The way you placed the swirls and sentiment is lovely as well. Very nice card indeed. Gorgeous card Corie. I hope we get this set in our new catalogue next year (in Australia). I have seen some fantastic cards made using it! WOW!!!! Corie this card is absolutely GORGEOUS!! I LOVE the color combo!! This is one of my favorite sets!! This is absolutely beautiful! Every detail is well attended to, and it's very pretty! Very pretty! I like how you used the scallop punch with this...it works great with that image. I miss copper brads too, but the chocolate chip ones you made are even better.